Pope John Paul II was born Karol Jozef Wojtyla in Wadowice, Poland. He was the youngest of three children. As a boy, he was athletic playing as goalkeeper in football. In 1929 at the age of 9, his mother died in childbirth. He and his father left Wadowice and moved to Krakow. It is here that he went to Jagiellonian University and attended a school for drama. He received a call to the priesthood, and eventually was ordained a Priest. He was named auxiliary Bishop and eventually appointed Cardinal, and went on to be elected Pope John Paul II. He reigned as Pope John Paul II from 1978 until his death in 2005. He was the first non-Italian Pope since 1523, and was the second longest serving Pope in history. He was a very charismatic Priest, and certainly one of the most influential leaders of the 20th century. He not only was instrumental in ending communism in his native Poland, but also assisted other leaders in eventually ending it in all of Europe. He became good friends with Margaret Thatcher, and President Ronald Reagan, who assisted to eradicate communism in Europe. He did much to improve relations between the Catholic Church and Judaism, Islam, the Eastern Orthodox Church, as well as the Anglican. He received criticism by the progressives, for upholding the Church’s teachings on contraception, and the ordination of women. Also conservatives and traditionalists criticized him for his support of Second Vatican Council and its reform. But overall, he was praised, for his firm, orthodox Catholic stances. He did not deviate in his teachings on the Catholic Faith. He also had a strong devotion to the Blessed Virgin Mary. He promoted devotion to this “wonderful mother of God, who loves us dearly”. He was one of the most traveled world leaders in history. He visited 129 countries during his Pontificate, and strongly wanted to be accessible to the faithful by visiting so many countries. He hosted record numbers of pilgrims, as large crowds would gather as he visited these countries. People everywhere loved him and his charismatic ways. He believed in the “Universal Call to Holiness” in his Papacy – keeping in line with this belief, he Beatified 1,340 people, Canonized 483 Saints, more than the combined total of his predecessors during the five preceding centuries. He named and appointed most of the present College of Cardinals. He consecrated or co-consecrated a large number of the world’s current see of Bishops, as well as personally ordaining many Priests. A key goal of his papacy was to transform and reposition the Catholic Church, to ensure it’s remaining true to Apostolic teachings for the next generation. He had a desire to “Place his Church at the heart of a new religious alliance that would bring together Jews, Muslims, and Christians in a great new relationship”. On March 31, 2005 followiing a urinary tract infection Pope John Paul II developed septic shock, a form of infection with a high fever and low blood pressure. He was not hospitalised but rather was monitored by a team of consultants as his private residence. This indicated that the Pope was close to death, and drew millions to watch vigil at St. Peter’s Square. He wished to die at the Vatican. He was given Anointing of the sick that day, and the lights were kept burning through the night where he lay awaiting death. Upon hearing that so many people have gathered around the Vatican, he stated, “I have searched for you, and now you have come to me, and I thank you”. On Saturday, April 2, 2005 at 3:30pm, John Paul II spoke his final words, “Let me depart to the house of the Father” to his aides, and fell into a coma. The Mass of the vigil of the “Second Sunday of Easter” was commemorated by his Secretary and two of his Polish Associates at his bedside. Also present at his bedside was a Cardianl from Ukraine who had served as a Priest with John Paul II, and Polish Nuns of the Congregation of the Sister Servants of the Most Sacred Heart of Jesus, who ran the Papal household. He died in his private apartment at 9:37pm of heart failure from profound hypotension and complete circulatory collapse from septic shock. This was 46 days short of his 85th birthday. He had no close family by the time of his death. His funeral set records for both attendance and the number of Heads of State present at a funeral; 4 Kings, 5 Queens, and at least 70 Presidents and Prime Ministers, and more than 14 Leaders of other Religious attended alongside the faithful. It set the record of the single largest Pilgrimage of Christianity ever, with numbers estimated well in excess of 4 million mourners – all gathered in Rome. His friend Cardinal Joseph Ratzinger conducted the ceremony, and went on to become our next Pope, Benedict XVI. He was interred in the grottoes under the Basilica, the “Tomb of the Popes”. On December 19th, 2009, John Paul II was proclaimed Venerable, and was Beatified on May 1, 2011 by Pope Benedict XVI. Pope John Paul II was a strong man of faith, that had witnessed many evils in his day. His native Poland was under the Communist control as a youth, his sister passed before his birth, when he was 9 his mother passed in childbirth, his only brother died when he was 12, and his father passed while in his late teens while attending college. He went on to be elected our Pope, and was the first non-Italian Pope in more than 5 centuries, as well as the second longest serving Pope in history. He worked until the end of his life to end communism, and had a vision of “Universal Call to Holiness”, calling all of us to the holiness that God so desired for us. He was a Pope very close to the people, and was loved by many. He traveled to 129 countries, to proclaim the word of God. His life was devoted to helping us find the pathway to heaven, our eternal home. 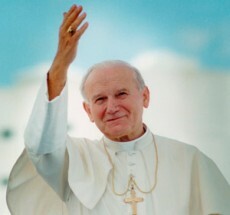 He is referred to by many, as “Pope John Paul II the Great”.